There are different degrees of signal system complexity for model railroads. The simplest being a signal that changes colors when a turnout is thrown. The more complicated are the ones that need a computer to tie together block occupancy and turnout direction. And there are signal systems that fall in between. The systems that utilize a computer are the most realistic, and the most expensive. If you want to add a signal system controlled by a computer, your DCC system should be capable of connecting to the computer also. Some beginner or entry level DCC systems can not be connected to a computer, but most of the advanced systems can be. Be sure to check your system before purchasing parts that you may not be able to use. Another consideration of the type of signal system to choose is your ability to understand electronics and wiring. If you have a problem setting the clock on a VCR or DVD player, or if you still do not understand your own DCC system, stay with the simplest type of signal system, one that does not require a computer. Implementing a Signalling system can be simple or complex.. If you don’t know anything about railroad signals and how they are used, you need to do some research to find out. Railroad signals are not traffic lights. They came before traffic lights, and the green, yellow, and red aspects (signal colors) mean different things. Some signal masts have two signal heads mounted on them. These usually indicate a diverging route of the track at a turnout. Signaling can be a hobby within a hobby, and to do it right takes research. The Internet is a valuable resource and you should take full advantage of it. Different railroads use different types of signals, so if you are modeling a particular prototype, you need to know what type of signals they are using. If your model railroad is freelance, like mine is, you need to decide what type of signals you want to use, then find a railroad that uses or used that type and research them and how the signals operated. So before you start, think about and decide on some kind of “Signal Plan” for your model railroad. You must decide what you actually want to do ! Next, decide what is going to make the signals change, and how you are going to control this. Typically this will involve one or more feedback modules, occupancy detectors and a computer. Decide if you are going to implement a simple system consisting of basic electronics or if your system is going to interface with a computer system. A signal is a mechanical, electrical or electronic device erected beside a railway line to pass information relating to the state of the line ahead to train/engine drivers. The driver interprets the signal’s indication and acts accordingly. Typically, a signal might inform the driver of the speed at which the train may safely proceed or it may instruct the driver to stop. 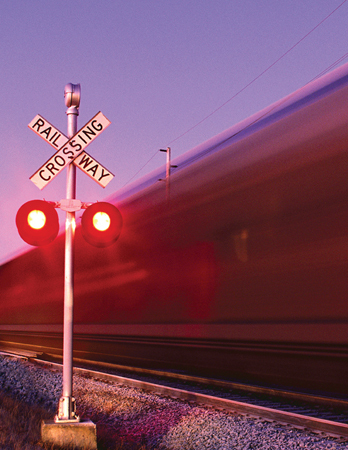 Railway signalling is a system used to control railway traffic safely, essentially to prevent trains from colliding. Being guided by fixed rails, trains are uniquely susceptible to collision; furthermore, trains cannot stop quickly, and frequently operate at speeds that do not enable them to stop within sighting distance of the driver. 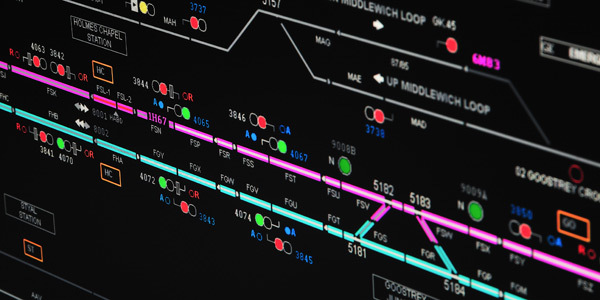 Most forms of train control involve movement authority being passed from those responsible for each section of a rail network (e.g., a signalman or stationmaster) to the train crew. The set of rules and the physical equipment used to accomplish this determine what is known as the method of working (UK), method of operation (US) or safeworking. Not all these methods require the use of physical signals and some systems are specific to single track railways. 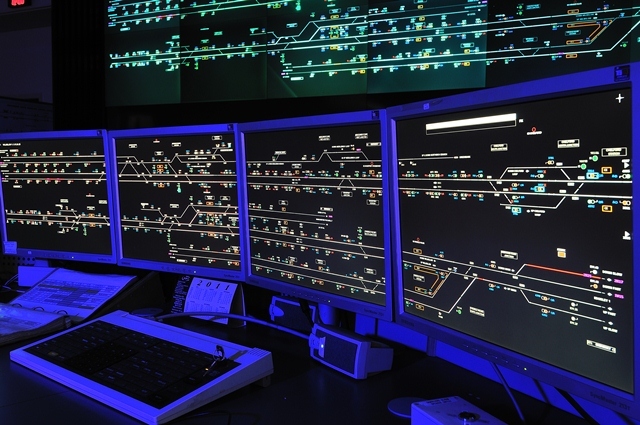 The Signal Box – Lots of excellent information on UK mechanical signalling systems. Radio Electronic Token Block – An excellent description of the operation of RETB on the Cambrian Line by Alan Jones on the The Signal Box site. Now the equipment is being replaced by ERTMS. Junction Signalling in the UK – A simple description, with diagrams, of how junction signalling is displayed to train drivers on UK main line railways. Written by Clive Feather. US Railroad Signalling – A good basic outline of US standard railroad signalling rules and techniques. Strange that it should be from Denmark, but well worth a visit. NORAC Signal Rules – posted on the North Eastern Railroad website, a virtual railroad for train simulator game players. Railroad Operating Rules – A complete set of the General Code of Operating Rules prepared by Daniel Dawdy on his CWRR site. These rules have been adopted by most US Railroads and including diagrams. The Railroad Signal Site – A page on the Webville and Hypertext RR website linking to various pages with diagrams of signal aspects encoutnered on a raiilroad operating in the 1950s. Strategic Railroading – A site run by Ron Lindsey which he describes as “A Technology Strategy in-sync with an Operational Strategy”. Mainly to do with signalling and communications and how it interfaces with operations, or not, as the case may be. West Country Railway Archives – A series of pages form the RailWest site with historical articles on the operation of UK manual signalling covering some technical content, e.g. BR(WR) tokenless block, Somerset and Dorset Joint Railway and other lines local to the area. La Signalisation Ferroviaire – A detailed site (in French) describing French railway signalling by Xavier Geillon. Early Track Circuits – A reprint by Tom Ehrenreich of an article from the Scientific American of April 1890 describing a newly installed track circuit controlled signalling system with pneumatically operated signals. Interesting too because London Underground still uses a similar system. British Signalling on the Bluebell Railway – A description of the typically British mechanical signalling equipment used today on the Bluebell Railway, one of the earliest preserved lines in Britain. There are simple explanations and good photos. Italian State Railways Signals – A site by an Italian Railway’s officer describing the systems and signals used. Lots of graphics and diagrams available in Italian and English by Martino Antonio. LZB Signalling – A description of the German ATP system, part of the interesting signalling site run by Wolfgang Meyenberg. The Signal Database – a long and mostly useful list of railway signalling sites from around the world. Central Line ATP – a good description of the automatic train protection (ATP) system used on London Underground’s Central Line by Clive Feather. Danish Railway Signalling – A useful description of the signalling of the Danish Railways in English. Has graphics of aspects and details of S-bahn (commuter) and main line signals. Danish Signalling – Another page on Danish railway signalling by Carsten Lundsten in English – including some excellent diagrams of Danish signals. Still being expanded. DLR Signalling – A good outline of both the original system and the Seltrac system which replaced it. The page is part of the excellent Docklands Light Railway site by R.P.F. Consemulder of the Netherlands. German Main Line Signalling – An excellent site with clear descriptions with diagrams of both basics and details of German signalling practices. By Wolfgang Meyenberg. German Railway Signals – Part of the light railway Feldbahn site which includes graphics and descriptions of main line and tramway signals in English and German. Railway Signalling & Operations – A good US site being developed with descriptions of US signalling principles by Mark Bej. It is unfortunate that it was never finished. Signalling on the New York Subway – A good description of the signalling system and its operation with graphics and photos by Bernard S. Greenberg. The NYC signalling is similar to London Underground’s in some respects so it’s worth a look for UK enthusiasts too. TGV TVM 430 system – This page has a description of the French high speed train signalling system originally written by Thierry Davroux for the European Railway Server site. There is a detailed French language version at La signalisation en cabine et sur les lignes à grande vitesse. Dutch Railway Signals – Diagrams of old and new signals in the Netherlands (English text). German Railway Signalling – German signals and signal boxes in English. Chinese Railway Signalling – From the same site as Wolfgang Meyenberg’s German signalling pages above. In English. Portuguese Railway Signalling – A description with diagrams of the different types of signalling used in Portugal. In Portuguese and English.